From start to finish, ChronoTrack timing tags will enhance the quality of each and every individual’s race experience including: the race director, participants, fans, volunteers, and support staff. By eliminating the hassle of chip distribution and collection before and after events, race directors can utilize their volunteers for other facets of the race, rather than complex chip distribution and post-race collection. All ChronoTrack timing tags take advantage of UHF RFID technology to provide industry standard results that timers and athletes around the world have come to enjoy and rely upon. ChronoTrack timing tags provide an eco-friendly choice for all participants looking to improve their carbon footprint. All three tags are recyclable or landfill safe and reduce secondary impact by scaling back the resources needed for distribution and collection. 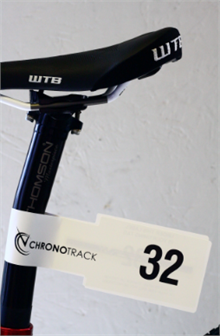 The ChronoTrack Systems Bike Tag is a non-invasive, non-catching and non-dragging UHF RFID timing tag. These tags are easily attached to the seat post, and are oriented to allow for visibility even up to speeds of 20-30 miles per hour. The combination of these features allows cyclists to concentrate on the race and not be hindered, mentally or physically. Although our matless splits are available for all races, it is in cycling and mountain bike races that they are most enjoyed! These side mounted antennas are ideal for cycling, skiing, cross country skiing, street luge and even for wheelchair division races. All of these events can benefit from this type of timing equipment which can be set up before road closures occur, provide a single redundant finish line, and offer lighter and more flexible equipment out on the course.